There’s no doubt that camp is a remarkable experience for girls. 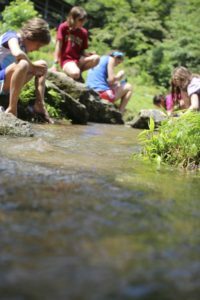 You can see it everyday here at Rockbrook, see it as you browse through the online photo gallery, and hear about it if you ask the campers and counselors how it feels to be here. 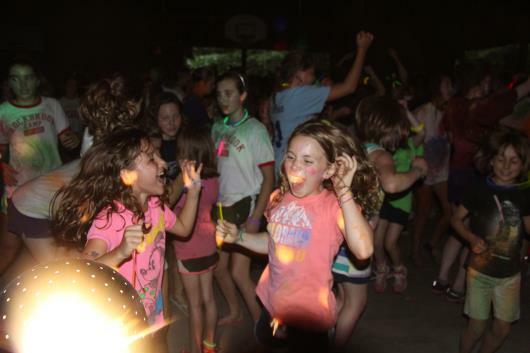 Of course, camp means having sensational fun, a “really great time,” but as we’ve said many times before, it’s more than that. Coming to Rockbrook means forming relationships, joining a community with a distinctive culture and language, and perhaps most importantly, learning important things about yourself that can make a difference to you later in life. 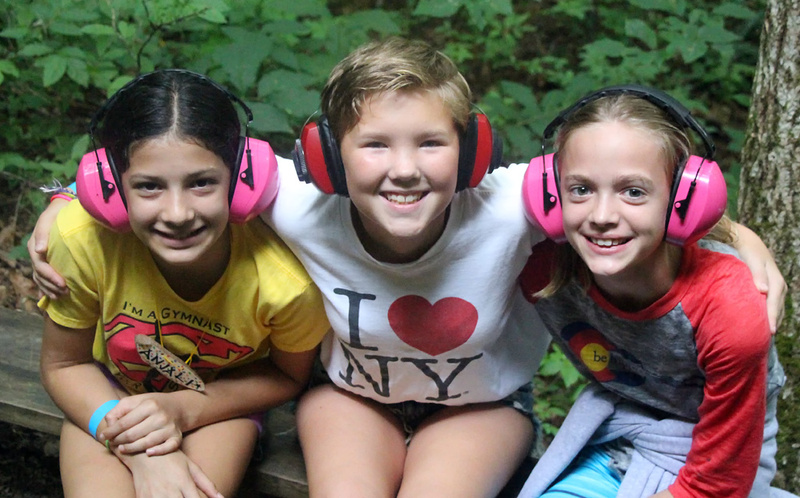 Lately, I’ve been thinking more about how camp is a “place for girls to grow,” about the ways that girls benefit from their time at Rockbrook. There are many, but let me focus on three of the more important ones: being kind, silly and brave. I think Rockbrook teaches girls to be kind. There are lots of reasons for this, but most of them spring from the close relationships we have with each other as a community. 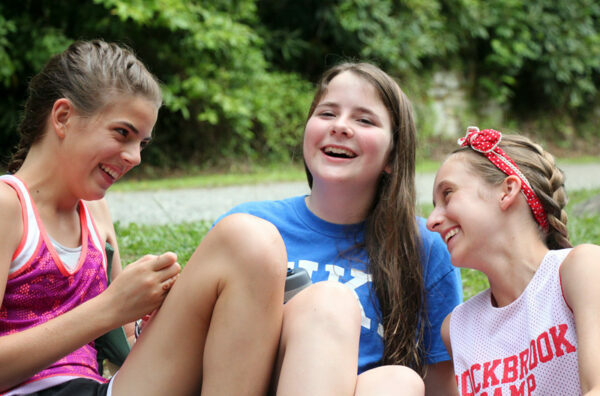 Being all girls may have something to do with it, as does the fact that we do everything, all day and night, together (There’s a kinship for all of us here), but the spirit of Rockbrook is rooted in being sensitive to the needs of others, in caring and generosity. The closeness of camp life, realizing that we are all together and that we all belong, fuels our sympathy and compassion for each other. It makes us kind. This explains why it’s the other campers who are first to jump right in and help comfort someone homesick in their cabin. 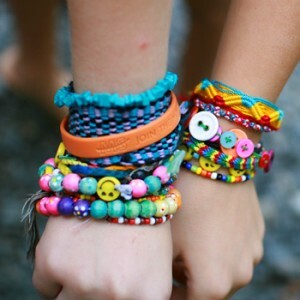 Kindness is at work when hundreds of friendship bracelets are exchanged every session at Rockbrook. It’s true affection for each other that sets the tone in every conversation around camp, while weaving baskets, feet in the creek, and twisting tie dye t-shirts, for example. Camp simply encourages heartfelt relationships. As we all relax and open up our true selves, we grow closer to each other, and kindness blossoms naturally. It’s darn right magical! 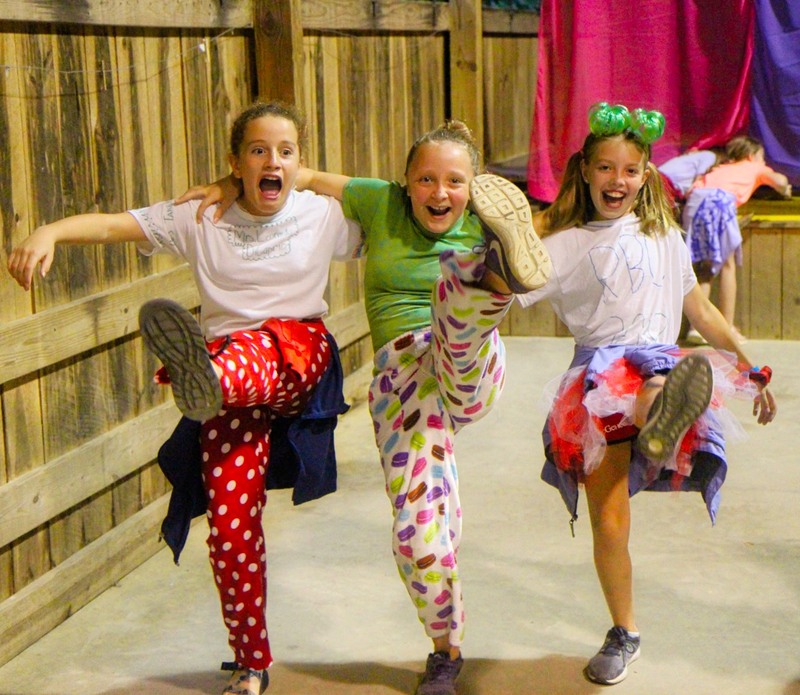 Rockbrook reminds girls that being a little silly is a good thing. There are times, of course, when we all have to be serious, but in many situations there’s room for lighthearted humor, a dash of exuberance, and more than one color. At camp, things are more silly than not, as we easily burst into song, ordinarily add costumes to whatever we find ourselves doing, and are quick to laugh throughout the day. 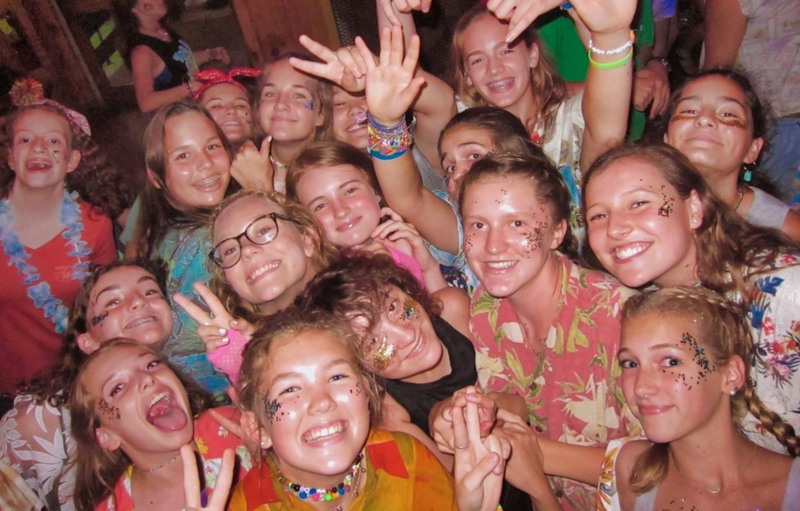 Life at camp feels good, and is more fun, partly because we’ve found a balance between serious tasks, like keeping our cabins clean and taking care of our health, for example, and the joy to be found by appreciating the silly side of our personalities. 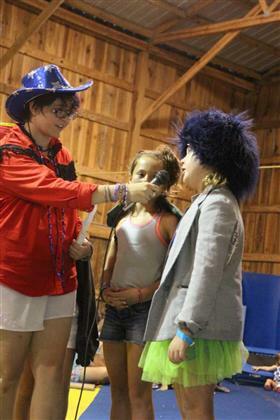 Camp teaches us that there can be a playful dimension to most things. We dance when setting the dining hall tables. We can sing… gosh, anytime! Waiting in line for muffin break, we can braid our friend’s hair, adding a flower we just picked. We can dress like twins with a bunk mate, just for the fun of it. 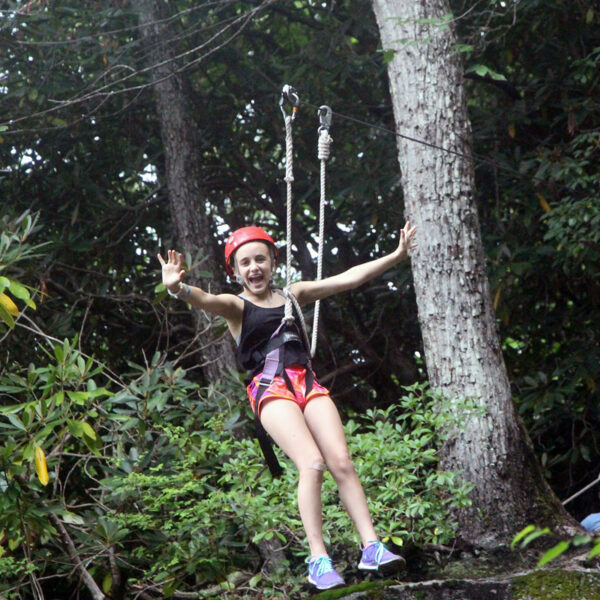 For girls at camp, it’s pretty easy to smile all day long and to make everything whimsical. In addition, developing this habit of cheerfulness nurtures the girls’ creativity. Learning that it’s OK, even preferable, to include some of their silly side when completing a task is like being given permission to mix things up a bit, to get creative while being productive. 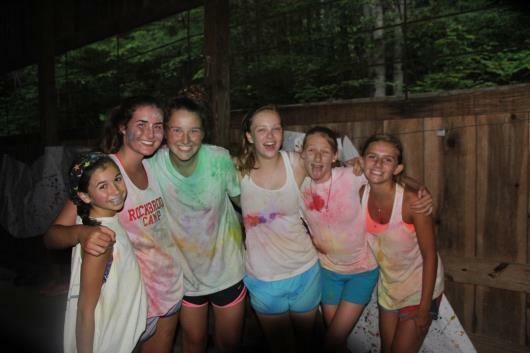 That’s why you see Rockbrook girls happily helping around camp, adding decorations to just about everything, and enjoying the most routine tasks. Being silly means being creative, and when done together, that makes something fun, no matter what. 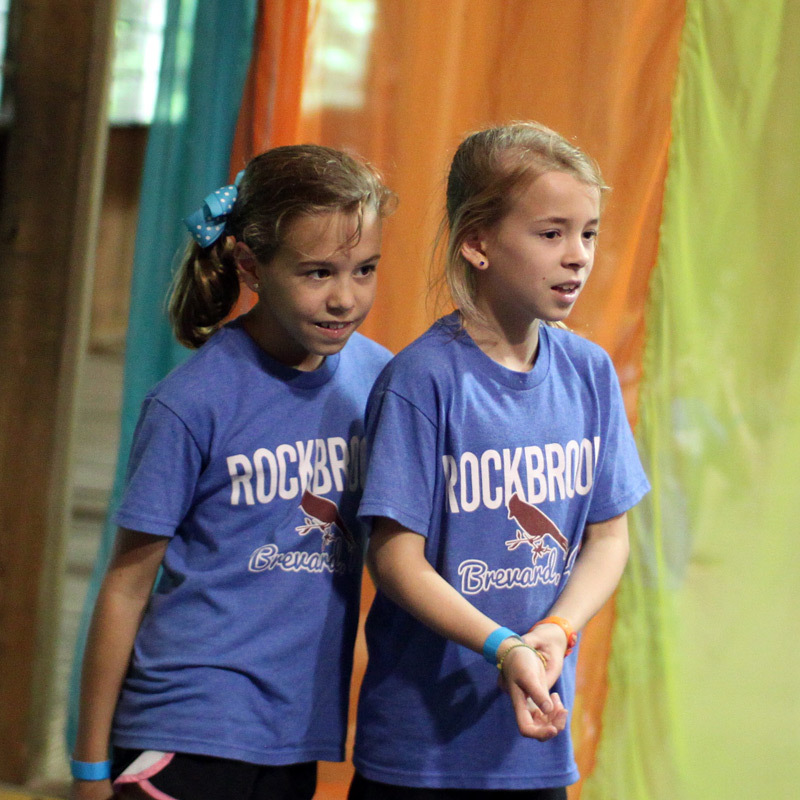 It’s also true that Rockbrook helps girls be more brave. 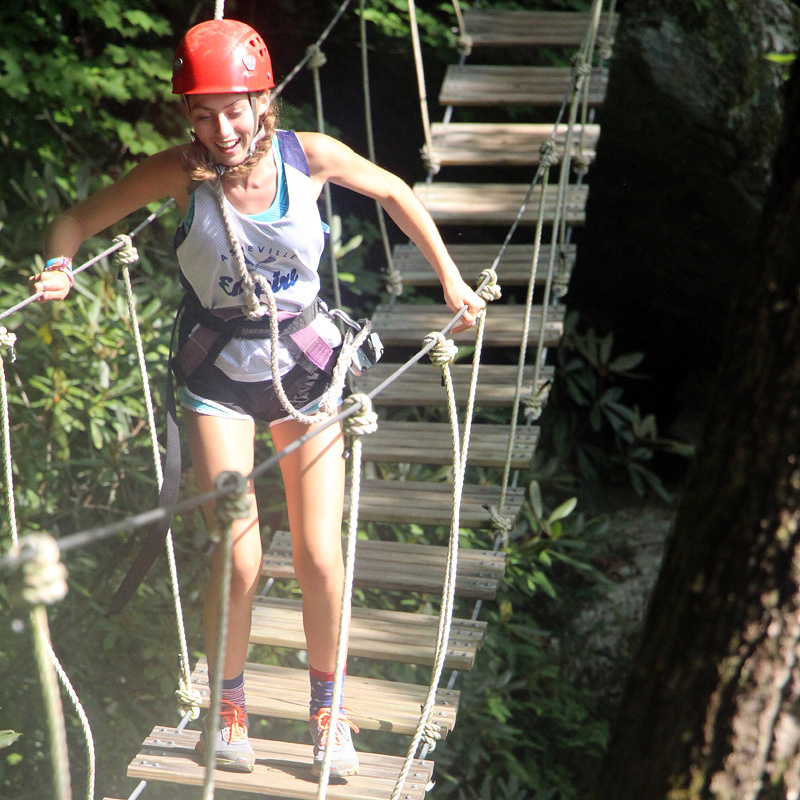 Simply deciding to come to camp, to leave the safety and familiarity of home, takes courage. So being here alone— navigating daily decisions (what to do during free time, for example), taking care of ordinary personal needs (remembering to take a shower, for example), and interacting with so many different people, unusual foods, and new activities —requires some degree of bravery. 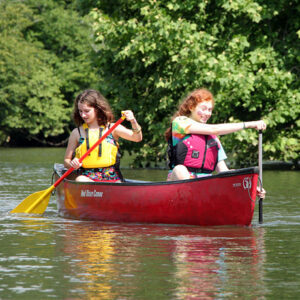 In addition, some of our camp activities themselves require the girls to muster their courage. 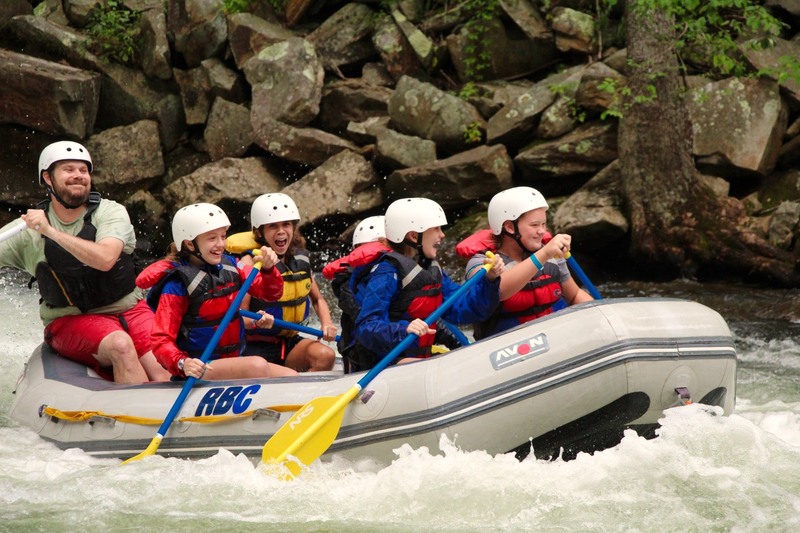 It’s completely natural to be afraid of stepping off a rock tethered to a high zip line cable, or to approach a new whitewater rapid in a kayak, or even to stand up in front of the whole camp to tell a joke during the lunch announcements. 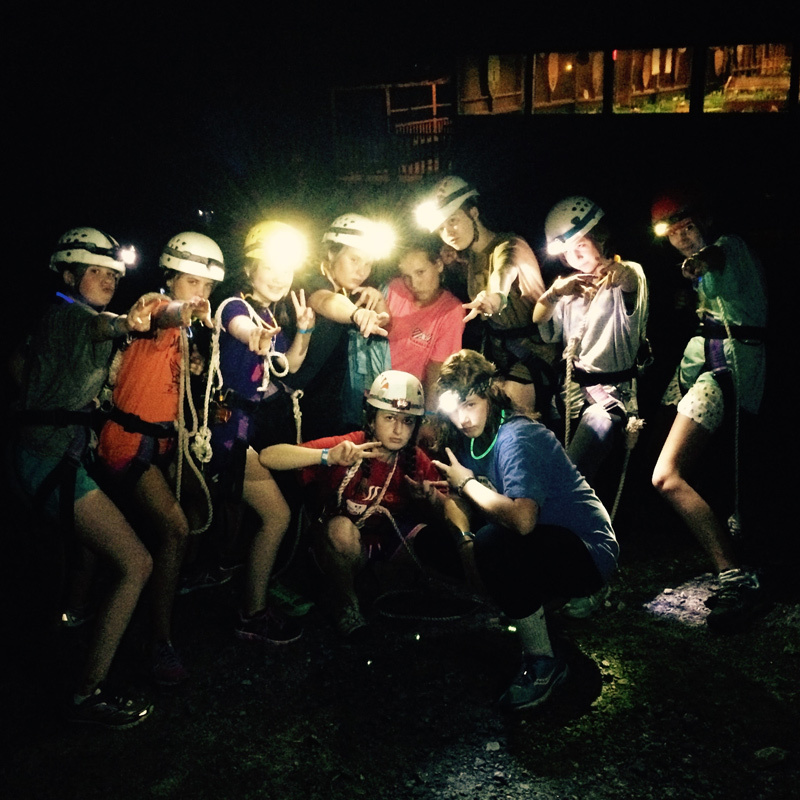 But these Rockbrook girls are choosing to do it— proving they are both capable and brave. A shy quiet girl at home suddenly is first to fly down the water slide at the lake. A girl who might never choose to join a painting class (thinking, “I’m terrible at art”) feels inspired to join her friends and enjoy the process of being creative. 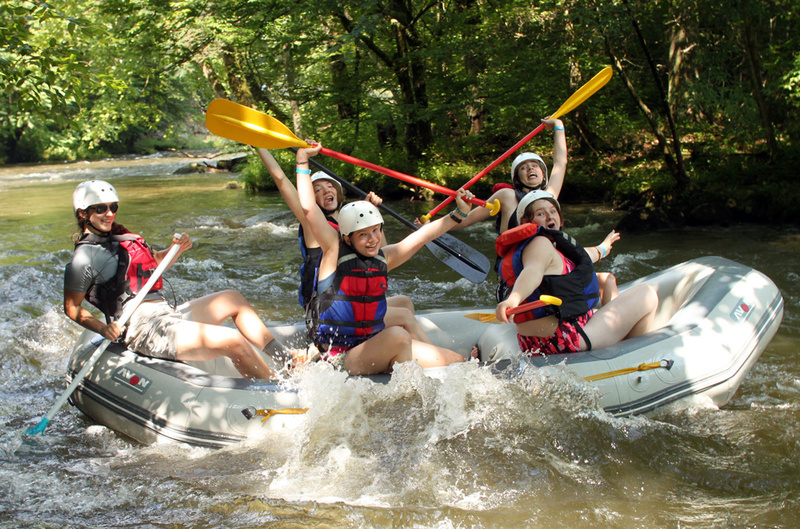 With encouragement springing from every direction, girls may discover the confidence to try all sorts of things they might never be brave enough to accomplish otherwise, from the physical challenges of sports, to the personal challenges of getting along with their cabin mates. 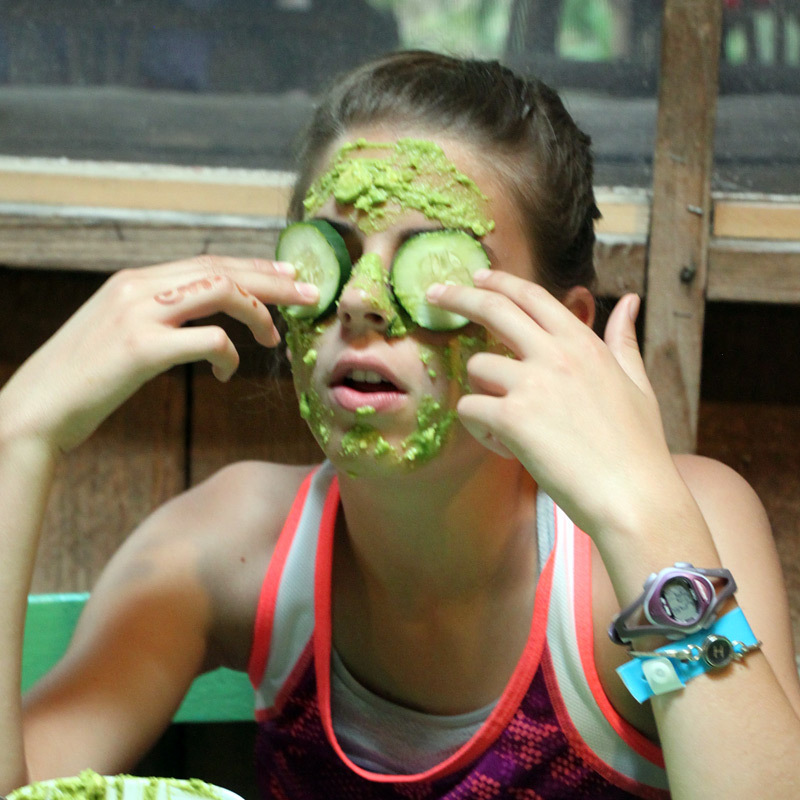 Life at camp inspires and encourages girls to be kind, silly and brave. It provides regular opportunities, wrapped in the guise of “Big Fun,” to develop these aspects of their personality. 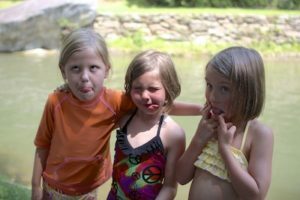 We hope that as they grow up, and carry the spirit of Rockbrook with them out into the “real world,” your girls will be happier and more successful strengthened in these ways. 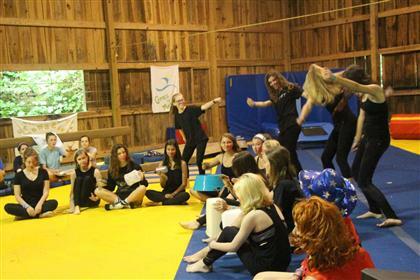 If you spent any time watching YouTube in the early Spring of 2013, you probably saw several examples of groups doing the “Harlem Shake.” But, you may not know that the second session girls at Rockbrook made their own version of the video. You can see the video embedded in this blog post, but here is a photo of the event that is great fun. Click the photo to expand it, and check out all those amazing costumes! Every Rockbrook girl knows the bittersweet feeling that comes along with leaving camp at the end of the session. We’ve had such an awesome time meeting new friends and trying new things, and leaving it all behind seems impossible. The friends and memories made keep camp on our minds all year long. 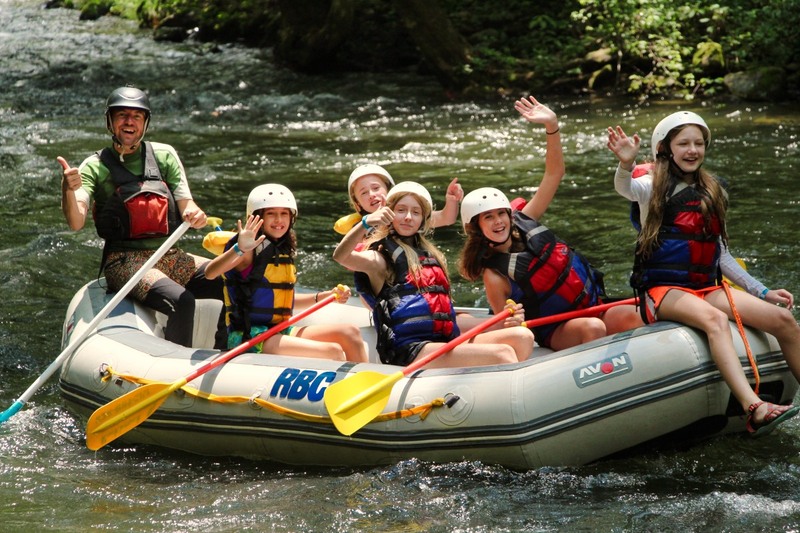 We all know the truth behind the words, “The summers fly by, but the winters drag on.” So, in an attempt to lessen the pain of being “campsick”, this is an ode to every Rockbrook girl who misses her days in the heart of the wooded mountain. I know what you must be thinking- camp isn’t SIMPLE! No way! 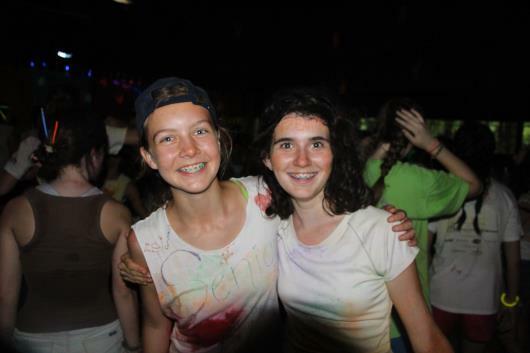 We do fun things all day and wear crazy costumes to lunch and paint our faces and dance in the dining hall!! 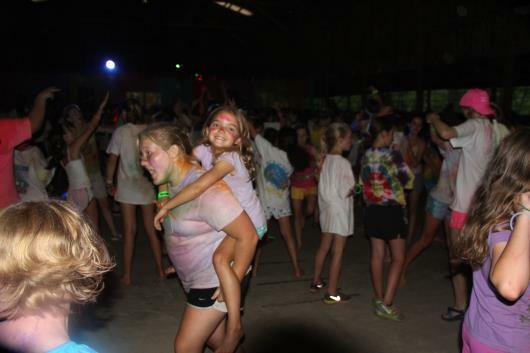 Allow me to clarify: camp is really the only place where having fun is our main job. We don’t have to worry about finishing our homework, making it to basketball practice on time or keeping up with our Facebook page. It’s nice to escape the pressures of home and just enjoy ourselves. 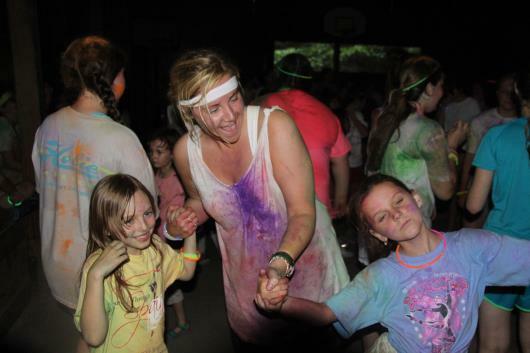 At Rockbrook, time slows down, life is easy, we find fulfillment in the simple things — wearing crazy costumes, painting our faces, and dancing our hearts out. Our awesome baker, Katie, is the best of the best, the cream of the crop, at the top of the totem pole when it comes to making muffins. Whether it’s a fancy mint chocolate chip recipe or a more simple funfetti or blueberry muffin, we can’t get enough! 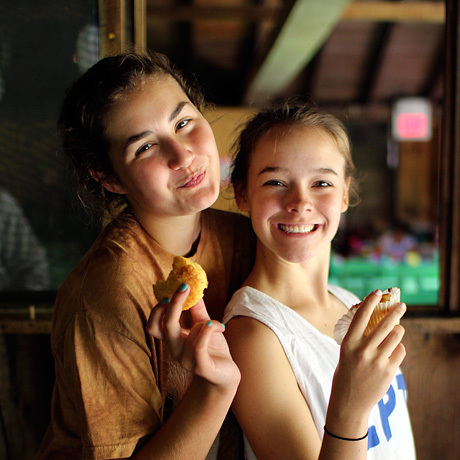 Katie’s muffins are just what we need after first period, and muffin withdrawals are no joke after we leave camp. 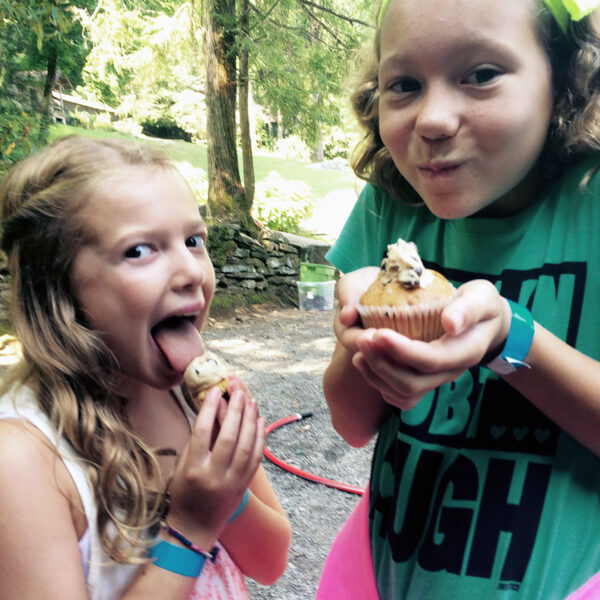 Check out this video that shows just how important muffin break is at Rockbrook. We all know what it feels like to have that counselor. You know the one I’m talking about — she makes you feel special because she truly cares about you. She’s interested in you and is there to make your camp experience the best she can. 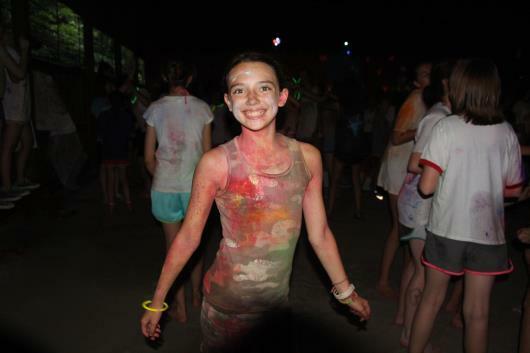 She’s cool because she understands that camp is cool. She’s like a fun older sister, like the most awesome baby sitter you’ve ever had. Most importantly, she’s a role model and a friend. Chevron. Twist. Totem pole. Diamond. Ladder. No matter how old we are, making friendship bracelets is a hobby enjoyed by Rockbrook girls far and wide. We spend countless hours at camp making bracelets for our friends. The only thing better than receiving a friendship bracelet is giving one. Free swims and twilights spent on the hill making friendship bracelets are when we make some of our best memories- memories that stay with us long after our bracelets fall off. I’d be lying if it weren’t included on the list. 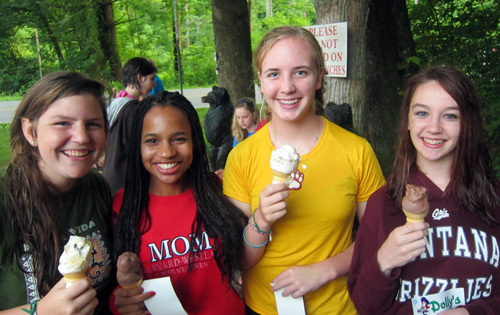 I’ve heard Rockbrook girls describe Dolly’s as the “best ice cream place in the world” on more than one occasion. Whether you choose to order our very own flavor, Rockbrook Chocolate Illusion, or to go a different route, chances are you won’t be disappointed. There’s no doubt that Rockbrook girls are missing Dolly’s this time of year. Camp friends are the best friends. Ask any Rockbrook girl, and she will tell you that this is true. It is because at camp we get to know one another for who we really are. The relationships that we form are based on real feelings, not on superficial things. At camp, it doesn’t matter what brand our new shoes are, or if we have the coolest new cell phone. It doesn’t matter if we are big or small, tall or short. What matters is how we treat people, how we make them feel. Camp friendships are built to last a lifetime. Yes, the Rockbrook songs are filled with silly lyrics like these. We all know that we’ve randomly started singing these songs at home or at school on more than one occasion. 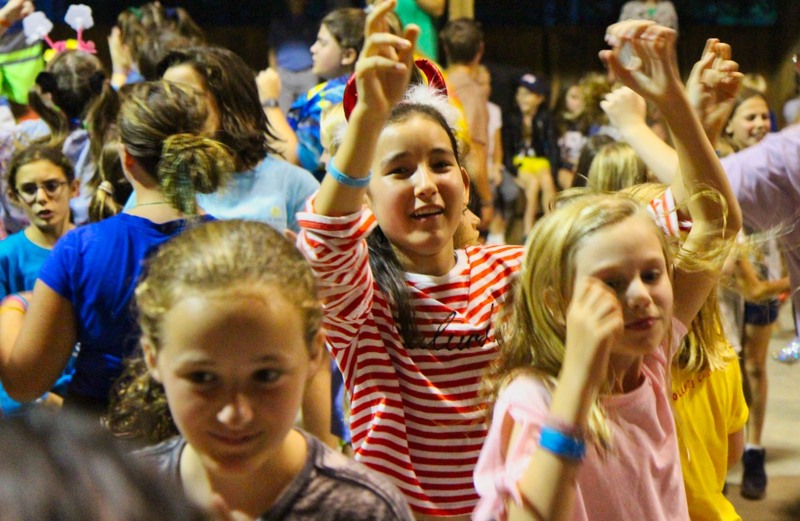 There’s nothing like singing along to a good Rockbrook song in the dining hall or around the campfire. Camp is silly. 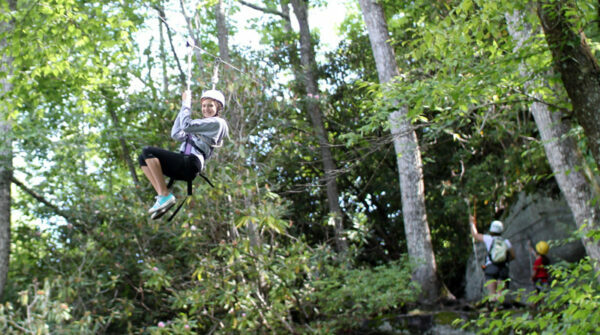 Camp is carefree. 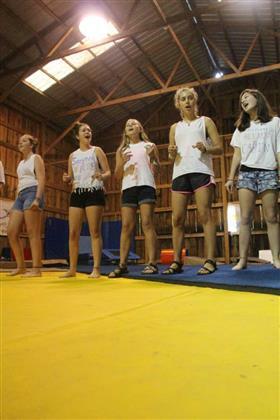 Camp is FUN. Ask any Rockbrook girl where her happy place is, and I bet she thinks back to a moment like this. A moment in which nothing matters but the present and time stands still. Things like this happen at Rockbrook. A lot. They are wild and magical and unheard of everywhere else. We miss having the opportunity to dress up in crazy costumes and dance with all of our friends. 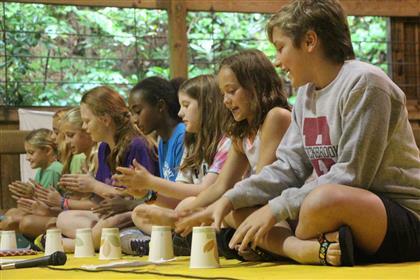 This video of the Rockbrook Shake reminds us just how wonderful camp is. 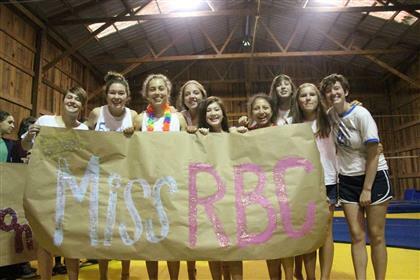 There is a feeling that we get as Rockbrook girls — one that we can’t really describe. A feeling of belonging, a feeling of certainty, a feeling of self-worth. It’s this feeling that causes us to miss each other throughout the year, that causes us to yearn for the days of summer. We know it’s real, because we’ve never felt a love like this. It’s this feeling that assures us that no other camp is like our own, that no other place can do for us what this one has. It’s the Spirit of Rockbrook, and it’s with us always. How silly can we be? Around here we enjoy answering that question on a daily basis. It’s another special aspect of camp; it encourages children to celebrate their goofy side, to forget briefly the personal decorum they so carefully guard, and which parents and teachers so urgently strive to form. 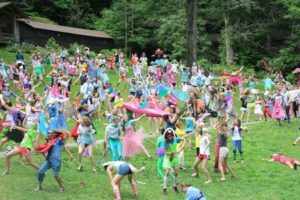 Camp provides a license to relive the freedom of childhood experimentation, to twist things around, to feel good about letting your inner creative energy express itself however it may. 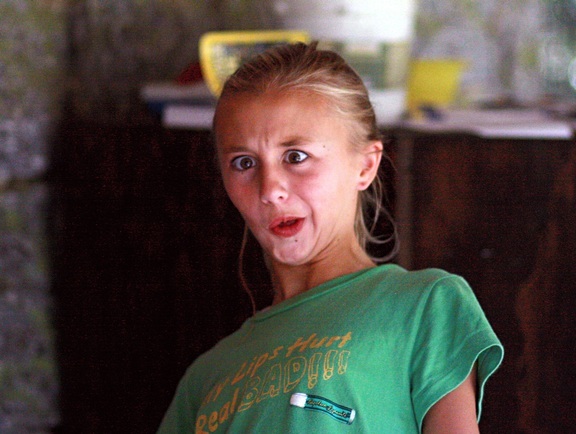 And significantly, being goofy at camp is something we do just for the fun of it, not to achieve some goal or to be recognized as “the best.” Around here, we— and yes, all of us campers, staff members and directors alike! —are quick to make a silly face for photos, to throw on a crazy costume, to take on a bizarre character in a skit, to sing a nonsense song during lunch, or perhaps bust into a wild dance move waiting for the dinner bell. All of this feels really good too. It’s remarkable when there are this many fun-loving people together, all within a broad camp culture that inspires creative silliness. 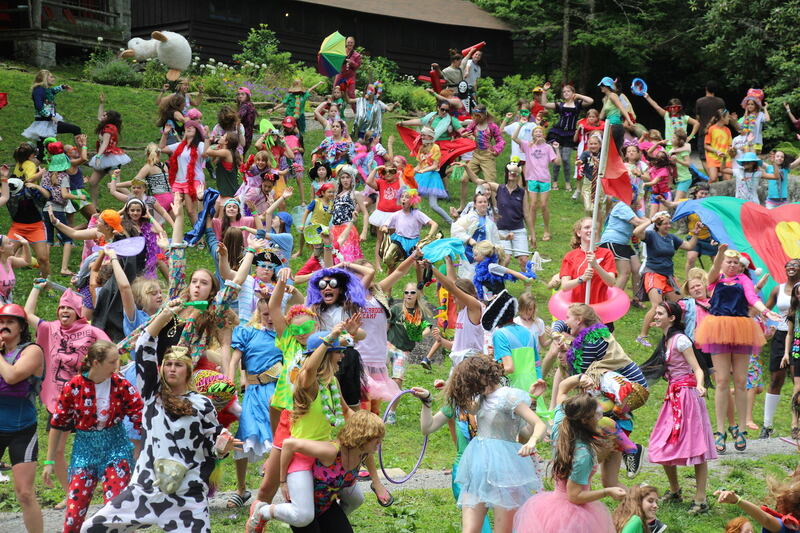 Sure we have our serious sides too, but I hope you can see why Rockbrook has has been called a goofy camp, and why we think that’s a very good thing! 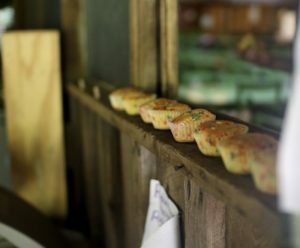 Did you know that everyday between the first and second activity periods, the entire camp converges on the dining hall porch for “Muffin Break?” It’s true, Katie, the Rockbrook Baker, begins each morning by baking a surprise flavor of muffin for everyone. That means powering up her giant mixer, then scooping and baking 300 yummy treats. Her flavors are fun and creative (maybe a little silly?). For example, today she made “White Chocolate Chip and Apricot,” and other days she’s baked us “Confetti,” “Up-Side-Down S’mores,” “Key Lime Pie,” and a big favorite, “Pumpkin Chocolate Chip.” This is a wonderful treat, easily a favorite part of everyone’s day. One of the old (circa 1888) log cabins at Rockbrook is called “Curosty” and it is the home of our fiber arts activities. It’s wonderful to wander in during the day and see girls weaving, working away on several floor looms, tabletop looms, and lap looms, creating complex patterned material using yarns and strips of cloth. Kimberly, Carol and the other instructors are helping the girls this summer make headbands, bookmarks, straps, and large table mats. 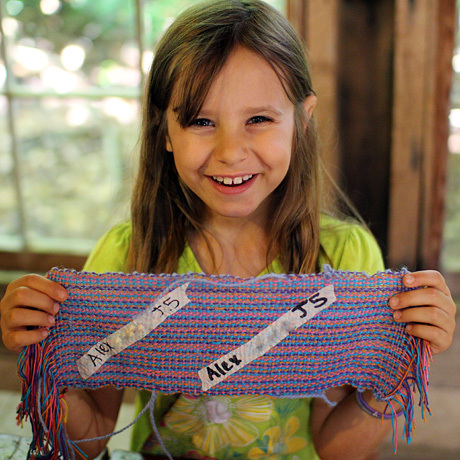 Weaving is such an ancient art, and in this historic cabin, it’s neat that these quite modern Rockbrook girls really take to it, ask great questions, are learning all the basic skills, and making some very cool projects. Weaving has always been an activity at Rockbrook, so it’s also neat to see it so popular even today. Emily and Christina, two of the women on our adventure staff this summer, took a group of girls canoeing down the French Broad River this morning. With snacks packed (some of the morning’s muffins!) and all the necessary equipment loaded on a trailer, they put onto the river upstream from camp in Rosman, NC. This section of the river is just right for a leisurely paddle with its wide course, gentle curves and manageable current. There is also the occasional (class I) rapid to keep things exciting. Large trees line most of the river making it the perfect habitat for water birds like the Belted King Fisher, for example. The weather for today’s trip was ideal too. Cool air and warm sun made it an magnificent day on the water. Since this afternoon was cabin day, a day when we switch gears from our regularly scheduled activities and instead do things together as cabin groups, we gathered all of the Senior cabins and took a gigantic trip to Sliding Rock. It was gigantic because when we added everyone up, this trip included 111 people! Like a train of white vans and buses, including a couple of cars for extra staff members, we drove our group into the Pisgah Forest for a picnic dinner and a few field games before arriving at the Rock. 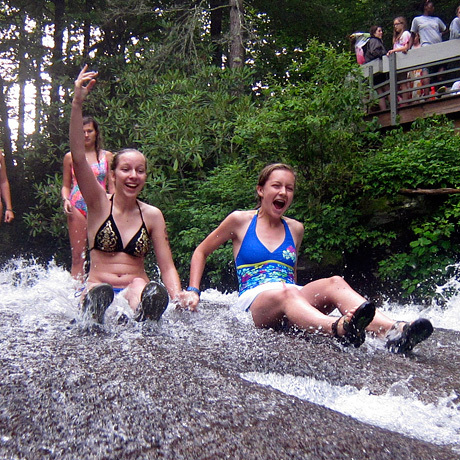 Zipping down a natural water slide formed by an icy mountain creek… Maybe freezing cold creek, would be more accurate … and plunging into a deep pool at the bottom might sound unbearable, but for the Senior girls tonight it was all thrills. Screams, splashing, chattering teeth, a few blue lips, but also wide, enthusiastic smiles were true to form all night. 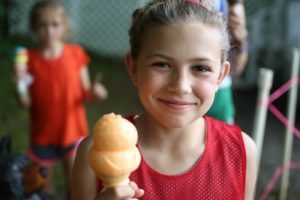 The last stop for the evening was to “warm up” with a cone of Dolly’s ice cream, proclaimed by many campers as “the best ice cream ever!” This is a chance to try one the flavors named after the many camps in the area, like “Rockbrook Chocolate Illusion” or “Carolina Iceberg Blast.” Warmed and energized by this blast of sugary cream, we enjoyed singing the Senior Song, posing for a few photos, and having a grand time together. 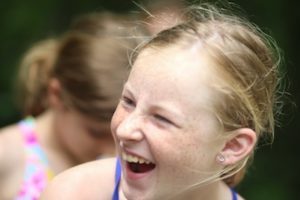 It’s hard to choose, but if you’ve come to Rockbrook, one of your favorite camp memories is bound to be a time when you’ve laughed your head off. It happens quite a lot you know. Just about every day you’ll be doing something— maybe making a bracelet, playing tennis, or just hanging out in the cabin with your friends— and somebody will crack you up. It’ll be someone telling a story, or maybe making a face, or just singing extra loud. You just never know. 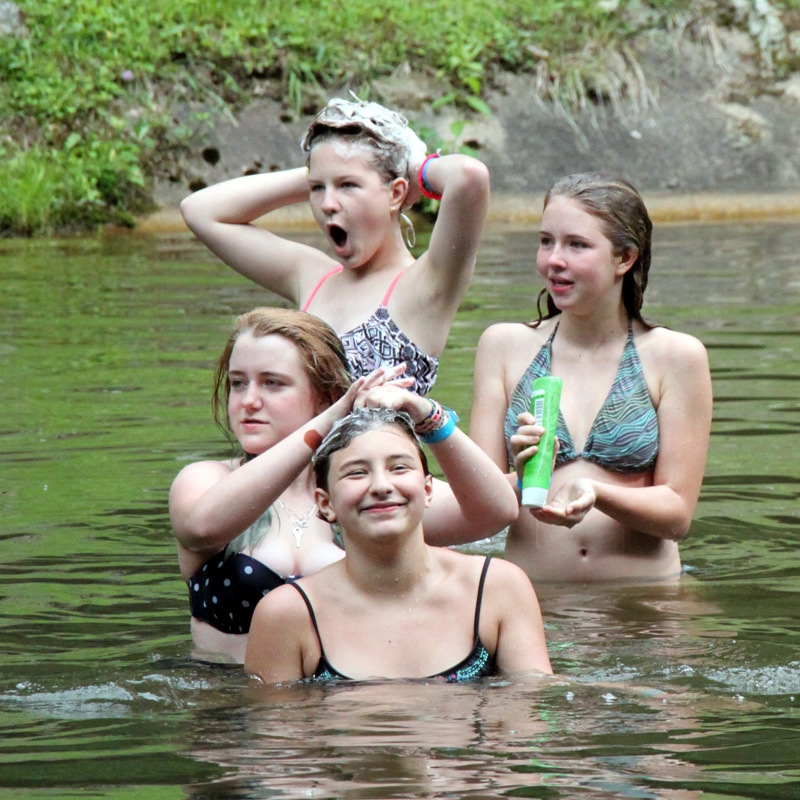 But when you get a bunch of girls together, get them to relax and enjoy doing all sorts of camp activities, you get one funny moment after another. While it might be hard to pick one, chances are your favorite camp memories will include laughing with your friends.